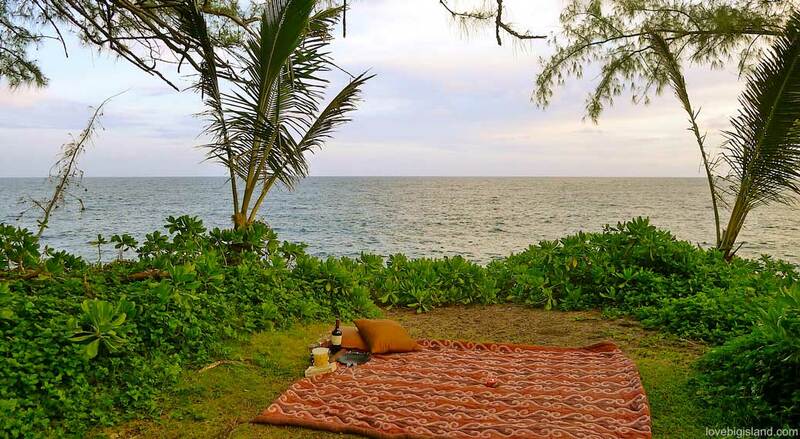 A picnic can add a fun diversion to your vacation on the Big Island. With a little bit of preparation such as packing a cooler with cold drinks and pū-pū’s (Hawaiian for an assortment of small meat and seafood appetizers), a picnic will fit perfectly between the activities you plan in the morning and the afternoon. There are many designated picnic areas distributed over the Big Island with proper tables and seating. You can of course also sit down and picnic everywhere where you find a calm spot with a nice view. Hawaii is one big picnic area. Make sure to take your cooler and some good local grinds! If you want to give your picnic a Hawaiian flavor, consider taking some of these foods along. These foods can be bought at almost all supermarkets (with the exception of the strawberry mochi and the wine). For more information on these dishes, have a look at our local specialties page. If you are driving through Hilo, pick up some delicious strawberry mochi at two ladies kitchen! Use the following list to go directly to your picnic area of interest or scroll down. Keokea Bay used to be a retreat for sugar cane workers. Nowadays, this 7-acre site has been transformed into a beach park with an elevated pavilion that facilitates good picnics. There is also a small pool on the right of the bay that is safe for swimming, and you can also take along your snorkeling gear, although this is probably not one of the best spots for that on the island. To get here, turn makai (towards the ocean) at mile marker 27.5 on highway 270 onto the Keokea Beach Road, and continue for a mile until you reach the rugged Keokea Bay. Next to an ocean view and picnic tables shaded by palms, this beach park also gives access to a large petroglyph field that is great for a before or after picnic stroll. Look for the Puako petroglyph trail (30 minutes roundtrip). To get here, turn ‘makai’ (towards the ocean) between mile marker 74 and 75 on Hwy 19 north of Kona. The entrance to the beach park is just right of the Fairmont Orchid Hawaii Resort. The Manuka State Park has an arboretum (a botanical garden for trees) that surrounds a lawn and a serene and expansive picnic area. The surrounding native and exotic forest hosts some hikes and serves well for an after-picnic stroll. To get here, turn mauka (towards the mountain) between mile marker 82 and 81 on Hwy 11, into the Manuka State Park. Read more about the Manuka State Park on our website. This huge fishpond is a point of tranquility in Hilo. It is also known as the “Royal pond’ because it served as a fishpond for three generations of Kamehamea’s. You can find picnic tables scattered through the park surrounded by a lawn and a variety of huge trees. For an after-picnic stroll you can try to find the Kamahamea Statue. To get here, park your car at the parking lot on the end of Piilani street in Hilo. These gardens are built on tiny islands on the east side of Hilo Bay, Coconut Island is attached to the gardens by a 75 meter (250 ft) bridge. From both the gardens and the island you have a 5-star view of Hilo. If you are an early bird and manage to get here very early, the sunrises from this spot are some of the best on the island! The gardens are named after Hawaii’s last ruling monarch, Queen Lili’uokalani, and have a serene quality. Next to picnic tables, you can also find the shortest river of the United states (Wailoa river, 1/3 mile) in these gardens, as well as good swimming and snorkeling spots. Coconut Island has as added bonus over the gardens that you can take a swim from either of the two very small but sandy beaches! Read more about Coconut Island on our website. Annotated map (from Google) showing the pedestrian bridge, two white sand beaches, the tower and parking area. If hot ponds are your thing, this is a great place for a picnic! Also known as Puala’a or secrets beach, this large (200ft x 50ft) warm spring is directly connected to the ocean and is surrounded by a beautiful palm grove! Picnic tables and showers are also available. To get here from Hilo, follow Hwy 130 past Pahoa, and go north on Hwy 137. The county park is at mile marker 10.5, just north of Isaac Hale beach park. More information on the Ahalanui warm springs. There are some picnic tables next to a scenic river in Waikaumalo Park. Part of the Hamakua Coast, this can be a good spot for a picnic if you are touring the scenic coast. Laupahoehoe beach park is halfway between Honoka’a and Hilo, on the wildly and beautiful Hamakua coast. It offers picnic tables and tide pools between stacks of lava rocks at the ocean that are definitely worth exploring! To get here, turn makai (to the ocean) just north of Laupahoehoe town onto Laupahoehoe point road. Follow this road for 1.25 miles to the parking lot and park entry at the end. Kalopa State Park is one of the hidden gems of the big Island. Tourists mostly overlook this large forest reserve which also houses a pretty park with picnic facilities. 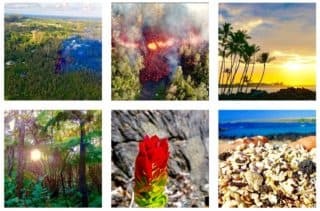 The park is at 2000ft elevation and has some great hikes such as an easy family nature hike (0.7-mile loop trail) in a native Ohi’a forest. To get here, coming from Hilo follow Hwy 19 and turn mauka (towards the mountains) after mile marker 39 onto Papalele road. From here you can follow the signs for 2.5 miles. Read more about the Kalopa State Park on our website.